The day I wrote this was April 15th and I had decided to talk about money as a topic because in the US it was Tax Day! One of my favorite sayings is, “The IRS loves and supports me.” For someone who has been audited twice, I love saying that and every time I get audited, it’ s fabulous and they get so confused that they just tell me to go away. For those of you who do not live in the United States, I’m sure you have other things that you battle with in dealing with money or other challenges related to money and that some type of tax situation goes on there as well. I want to discuss what goes on in our bubble about money and I call it “Bubbletalk for Money.” Bubbletalk is the unconscious thought that block us from getting what we want. This is going to dig deep into your unconscious beliefs around money. You are the master of your domain and your employee is cash. Get in touch with it and say it outloud, “Cash.” Cash is an awesome word; it’s a way of speaking. It really is just a word and people put so much energy into what money, cash and assets are along with all those things that create wealth, or so we think. 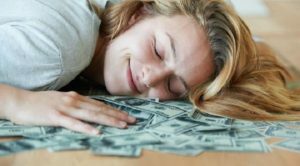 What are those unconscious beliefs around money? Here is my story and to make a long story short, I was bankrupt. I lost everything, my house, my business and I went through a divorce. The only thing I had left was a car with one headlight and one door that didn’t work and my 2 ½ year old son. I was a single mom and things were challenging for me while living with a friend, basically having lost everything I had. All I had left was my son. Fast forward to now, I have millions in assets, a fabulous husband, my company Essence of Being is going strong for the last 25 years, and I get to travel around the world teaching thousands of people about what I’ve learned. I not only teach about money but also about relationships, purpose and how to really get what you want out of life. My son is now a successful graduate of New York University and is living in Manhattan, travelling the world, himself, singing, dancing and acting and getting paid doing what he loves! I am not talking about this to gloat but to show you that I am a testimony to the principles and belief systems that I share with you along with tools that work. No matter where you are in your goals for prosperity, you too can have what you want. Bubbletalk is that voice from our unconscious or subconscious mind that tells us things that we don’t consciously know. It stems from our deepest beliefs about who we are. Just imagine a bubble about your head like a cartoon character that is thinking about something. These bubbles are the subconscious thoughts that you have running in your mind all the time. Our brains have conscious thought, both positive and negative. Some examples of positive conscious thoughts, which you say or think to yourselves include, “I choose to be wealthy” or “You know what? I want a red Mercedes” or “I want to be happy.” In addition, we also have unconscious or subconscious thoughts, both positive and negative, however, most of the time, we aren’t aware of what we are thinking because they are thoughts that are not in our conscious awareness. Subconscious and unconscious are words I will be using interchangeably. What is our subconscious mind thinking? If you ever want to know exactly what you are thinking on an subconscious level, just take a look at your results. The results in your life are the drivers on your journey of reality. In other words, consciously you may be choosing to have a certain type of reality, but underneath in the subconscious, there is something blocking you from having what you want. What is happening is this. You may be saying one thing about what you want in your life, but your unconscious believes something entirely different. As a result of this, when you do affirmations, which I call little lies you tell yourself that you don’t believe until they come true, the appearance is that those affirmations aren’t working as quickly as you would like them to. One reason is that your conscious and unconscious thoughts are not aligned. What this means is that, as an example, take a look at the brake and gas pedals in your car. The gas pedal reflects your conscious thoughts and the brake pedal reflects the unconscious thoughts that may be blocking or literally stopping you, which is what we would call resistance. In essence, your gas pedal is your desire and your brake pedal is your resistance and when you have your gas and brake pedals on at the same time, you spin your wheels and stay or feel stuck. This is what happens in relation to our money issues. Here is a great example. Let’s say that you affirm that you want to have money and abundance and do the action steps to achieve your desire; checking your credit report, creating investment strategies, creating budgets, using all of the tools which are here for us on a conscious level. Underneath all of that in your unconscious is your belief that you can’t have it which is your resistance. You may be thinking you are not good enough to have it, you don’t deserve it, or you aren’t worthy. Any of those thoughts will block your true nature. Now this part is very important to really understand. Your subconscious mind doesn’t know the difference between an actual experience and the one that is imagined. Just like, if I told you to think about a lemon and your mouth begins to water, but the lemon is nowhere in sight. The same holds true with all thoughts. If you think of creating what you want in the world, it’s just like sending a signal or energy vibration out from your brain to the universe to create it for you. What happened, though, is that you have accumulated a lot of evidence from your past and your present that you think you cannot have certain things in your life or maybe it’s just too hard and that, my friends, is how your belief systems are formed. Stay tuned for Part 2 on Belief Systems.